Heavy metal residues in sediment and Oreochromis niloticus fish muscles, collected from a Nile River Canal (Bahr Shebeen Canal), Egypt, were investigated from September 2014 to December 2015. The spatial and seasonal distributions of Cd, Cu, Fe, Pb, and Zn are described and discussed. Relative abundance of these metals in sediment was found as follows: Fe > Zn > Cu > Pb > Cd. 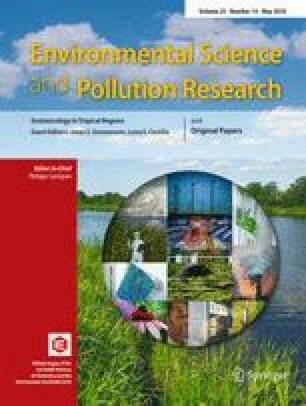 Indices of pollution were used to detect the degree of sediment contamination and indicated elevated concentrations likely to adversely affect benthic and benthic-associated organisms. Anthropogenic activities strongly influenced metal occurrence in sediments. Accumulation of heavy metals in fish muscular tissue was found to be nearly comparable to the sediment. Relative abundance of metals in fish tissue followed the trend of Fe > Zn > Pb > Cu > Cd. Fish can be used as a surrogate for heavy metals pollution. The bioaccumulation factor (BAF) in fish muscle showed the following trend: Pb > Zn > Cu > Fe > Cd. Levels of most selected heavy metals detected in muscular tissue of fish were below admissible limits set by different organizations. However, HI (hazard index) showed that the cumulative risk effects are of considerable concern, especially where fish consumption is high. Consequently, it is recommended that discharged water containing pollutants should be prioritized to include continuous monitoring, and adequate public awareness. This research is funded, for the first author of this article, by the University of Minoufia Research Projects Fund. This article does not contain any studies with human participants or animals performed by any of the authors. Only caught fish by fishermen are used.